I’ve always liked Dr. King, even as a kid in elementary school, when I didn’t really understand the impact of his life on twentieth century America and the world. 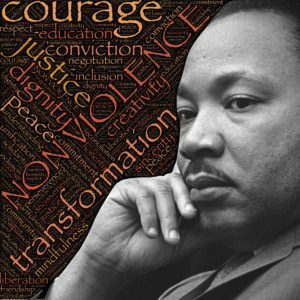 Little did I realize in Mrs. Smith’s class in the fifth grade that King’s death had come just about a decade earlier and “I have a dream” not much longer than that. Since that time, Mrs. Smith, who was herself an African-American woman, had lost both Kennedy brothers, Medgar Evers, and King himself, both very discouraging losses considering that the hope they brought to civil rights. Back then my world focused just on myself and the uncertainties that seemed to surround me, my sister, my single mother and my grandparents, who I felt kept us all afloat. Though I don’t remember back then like it was yesterday anymore, I do remember the general unease I felt about making friends and being accepted, and there was one boy, also African America, who seemed to do so with ease, and often with sarcasm and insults. One day with wounded pride I exercised my white privilege. To this day, I don’t remember what he said to me. Probably something mean. But I remember I lowered myself to beneath him to make him feel bad. My family had told me not to say it, although my grandfather said it often enough in hushed tones. But I knew my mother wouldn’t have liked it—she was the type that had wanted to be in the peace corps when she was younger, and valued harmony, much like myself. I didn’t do it because I didn’t like black people—I didn’t learn the term African-American until college. I didn’t particularly hate the boy—I’ll call him Robert here. He was charming, usually funny, and probably a good guy. But he could be hateful and mean sometimes when he was frustrated. I did it because I felt hurt, blamed him, didn’t know how to fight back, and for some reason I couldn’t let it go that day. So I used the ugly word that I knew only a white person saying could make him feel less, and he told Mrs. Smith, I admitted it, and I received a consequence. But my real consequence wasn’t having patrol duty taken away for a time. It wasn’t being grounded, and it wasn’t even having to tell my family. Truthfully, I don’t even remember consequences coming from that. The real consequence was that I’d used a racially charged insult as a weapon. It haunted me. Not that I felt like I was headed toward the Ku Klux Klan, or even that Randy was suddenly better than me because I’d used the word. It was a sort of emotional violence, a violation of the brightest part of me, a reflection my own codependency on being pleasing. It exposed my own darkness, revealing to me that if I could choose to use that power against him, I was certainly no more than on a level playing field with him. If I could crush him, and chose to do it, I was no less a monster for that than he was for his insulting and sarcastic manner. Some twenty years later in my multicultural counseling class my teacher discussed those very issues of race and power. Our class comprised of different races and ethnicities, he himself was a light-skinned African American who had wedded a white woman, and drew attention to both his skin color and family makeup so that he could discuss them as racial factors in class. Among other assignments, the class was to read The Autobiography of Malcom X, a figure who I knew mostly through clips of a Denzel Washington biopic and some talk of the Black Panthers in history class. I was stunned to read that, like Dr. King, Malcom X evolved to nonviolence, to the chagrin of many followers who wanted more forceful action from him. Though he himself was soon killed, it was no before he had embraced Islam as a peaceful religion. My teacher also addressed he issues of prejudice, racism and power, and how they were interrelated. As the complaint of reverse racism became a contention in my class, he agreed with everyone that prejudice was a part of being human, brought about by a lack of understanding of the other. What made the difference in someone being racist was the ability to use one’s power to hurt or control another because of his or her existing prejudiced belief system. Thus, if one person or group is financially or politically dominant, power could be used to enforce the belief system, like a Jim Crow law. This idea settled me because it gave me a space for my own questions about reverse discrimination. It also brought the realization that if one desired harmony it meant that one must also use one’s own personal power to bring it about. In my mind that meant advocacy, encouraging dialogic communication, and helping raise global consciousness. This morning, some ten more years later, the irony of it being King’s birthday, the end of Barack Obama’s presidency, and the week of Donald Trump’s inauguration is not lost on me. Looking back to elementary school I wonder what went through Ms. Smith’s mind when she’d learned I used the “n” word. To my remembrance, she was the only African-American teacher at Kos Harris Elementary. I don’t remember how old she was, but probably she was at least a young teenager with King. If she is alive, I wonder how she felt when Obama was elected, then at his inauguration. I also wonder if Randy remembers that insult, or if he blew it off as bad childhood judgment. My guess is that he grew out of his meanness and is using his charms to either support a family or contribute to his community or both. I wonder if that was the worst that came his way racially. Somehow I doubt it. Finally, I wonder where we are going to go as a country. Will the next years be more extreme polarization or dialogic conversation? Will sides demand or compromise? Will echo chambers continue or will there be a merging of ideas and openness to the other? Maybe the most any of us can do is destroy our own echo chambers and reach out to the other. When we meet the other, he or she is often good to get to know. We introduce the other into group echo chambers, and some from the group leave the chambers while others stay, or eventually the group chambers are destroyed as well. Today, I remember King and all he stood for, and I hope for the coming together of us all. May his dream manifest, and may the Ms. Smiths and Randys of the world have racial insults only in their minds as they read about them in history books. Even in the seeming ruins of our collective dialogue, may we reach out to one another and integrate if not our beliefs, at least our mutual respect and dignity. There is no choice–we must if we are to be together.